Friedemann Friese’s own account of the origin of his river-rapid racing game Fast Flowing Forest Fellers does not exactly speak of the product of a moment of revelation. ‘I had the idea of making a race game,’ he writes, ‘with totally different boards and a simple mechanic.’ No individual part of that idea is especially novel, and nor is the combination. Formula Dé and Roborally, the most celebrated of the many predecessors of Fast Flowing Forest Fellers, are both mechanically simple racing games, and are each playable over multiple courses (Formula Dé in particular boasts a phenomenal amount of extra tracks available as expansions). Each game predates Fast Flowing Forest Fellers by many years (Fast Flowing Forest Fellers was released in 2008, while Formula Dé came out in 1991 and Roborally in 1994). However, Fast Flowing Forest Fellers improves upon its predecessors in a respect which is easy either to overlook or to under-appreciate: it is much quicker to play. Where Roborally and Formula Dé can each run to well over an hour, even a five-player game of Fast Flowing Forest Fellers should seldom take more than half that time. Given the tactical and strategic simplicity of each of these three games, the brevity of Fast Flowing Forest Fellers is a very important element in its favour; its duration is in better balance with its density. This is not to say that there is no capacity for clever play in Fast Flowing Forest Fellers. There is. As in Roborally, a good number of its courses constitute tricksy spatial puzzles: criss-crossed by currents, and littered with logs, getting to the finish fastest is seldom a matter of blitzing straight downriver. Sometimes moving less far, or moving sideways, might be the best option, if it minimizes the chance of being bashed around by logs and other players. In the game, each player is trying to guide either two or three lumberjacks (depending on the number of players) to the end of the course. The first player who manages to steer all of his or her figures to the end of the course wins. A player’s movement options on any given turn are, however, limited by a personal deck of cards. Each turn a player selects one card from a hand of three, this determining which figure moves, and how far it can move (a card might allow movement one, two, three, four, or five spaces). Unlike in Roborally, these movement cards do not determine direction. Whichever card is selected, a figure is allowed to move upriver, downriver, or sideways, and could even double back on itself. In order to negotiate logs, and other player’s figures, this range of movement options is often valuable. Logs appear in vast quantities on some of the game’s boards and are sparse on others, but whether present in large number or not, they tend to create choke points in whatever location they feature. Dealing with them and the problems they create is another of the neat innovations offered by Fast Flowing Forest Fellers. They let the game feel cluttered and anarchic, as it should, even with a lower number of players. The logs can be pushed, as can other players figures, though only in the direction a figure is travelling (i.e. they cannot be swept aside). This means that removing obstructions tends to mean spending valuable movement points getting to the side of a log. In this lies a neat way to keep players close to one another. Any figure well ahead of the others is likely to lose a good deal of its advantage in clearing logs (which will then pose less trouble to players behind). A player who has drawn many of his or her best cards early might feel irked by having to do this work, but it is important for the game as an experience that players should be close to one another: after all, the primary pleasure in Fast Flowing Forest Fellers is not in pushing around dead trees, but in pushing around other players. Watching a log thwart a rival has nothing on the joy of getting in his or her way yourself. Currents offer the most potential for mischief. Any figure or log which ends a turn on a current space will be carried in a given direction. Often, this means a trip back upriver. Many boards are designed to allow chain reactions, where a series of figures can push one another onto consecutive current spaces. Thus, one need not always pick a particular friend to pick on: on occasion, one is offered that special pleasure of screwing over all of one’s friends at once. It is, need I say it, quite delightful when this works out. 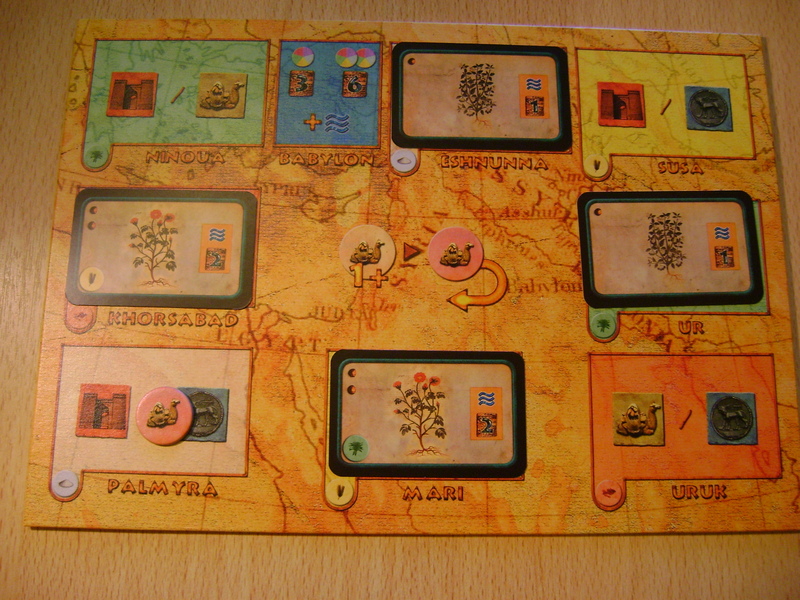 The design of the game boards (there are six, all double-sided, two of which are chosen each game to form the course) is such that messing with multiple rivals is frequently possible. Spotting this kind of opportunity to interfere with others can sometimes take a little thought: comparing the possible effect of one series of shunts to another does take a certain amount of imaginative effort. But that’s to the benefit of the game, in my view. Sometimes the way one might intervene with other players is entirely obvious at first glance, but sometimes not. Perhaps once or twice a game you’ll end your turn celebrating your own cunning, having seen a chance for awkwardness which escaped everyone else’s attention. In half an hour, I need a game to give me some potential to feel a sense of achievement. In temperance, however, it should be said that in most cases it is possible for players to irk one another, but not to be downright infuriating. A couple of boards have very long currents running upriver, but in most cases a nudge might only set a player back two or three spaces. Also, any player aiming to win will often find himself or herself pushing opponents downriver: because the river gets crowded, it’s often necessary to advance another player in order to improve your own position. To win, it stands to reason you can’t spend all your time knocking everyone else sideways. That interaction with other players comes in the form of alternating help and hindrance makes Fast Flowing Forest Fellers a fair old hoot to play. There will be begging, there will be gloating, there will be cackling. There will be times where you are presented with straight choices, where you must help one or another player, or must hurt one or another. Other racing games might also spawn such situations during the course of a game, particularly those racing games of the Roborally ilk, but Fast Flowing Forest Fellers maintains this kind of interaction throughout its length in a way its predecessors typically do not. It might not be that much is new, but it represents a beautifully engineered chaos. I am often struck by the diversity of the output of many of the foremost designers of board and card games. There’s not overtly much that ties, say, the behemoth of resource conversion, Ora et Labora, to the gender-stereotype party game, The Difference Between Women and Men, but yet they share Uwe Rosenberg as a designer. The same figure who concocted the phenomenally hefty fantasy game Mage Knight, Vlaada Chvátil, also came up with the very, very throw-away rabbit-impersonation game, Bunny Bunny Moose Moose. It’s great, of course, if designers feel they can follow through with ideas of any flavour: long may board game culture be one with celebrates (or at leasts permits) this. Nevertheless, there is a flipside. Imagine, say, becoming keen on a band on the back of a first album of raw garage rock, only to learn for their next they’ll be trying out polished electro-pop. One might admire the boldness, one may well be interested in hearing the results, but one would also have the right to be suspicious: the two styles are rather different to master, and the assumption that the same group would have a command of both would be a dubious one. 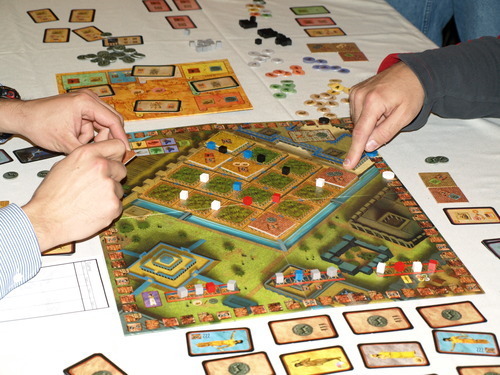 The world of board games is one in which many designers are this eclectic (or more). Therefore, it’s not realistic to suppose that because I’ve enjoyed one or two games by a given designer I’ll necessarily be likely to like other games he or she has created. I cannot just look at the name on the box: I have to go beyond it. Of course, this said, some of game design’s more versatile figures do have recognizable strands within their work. 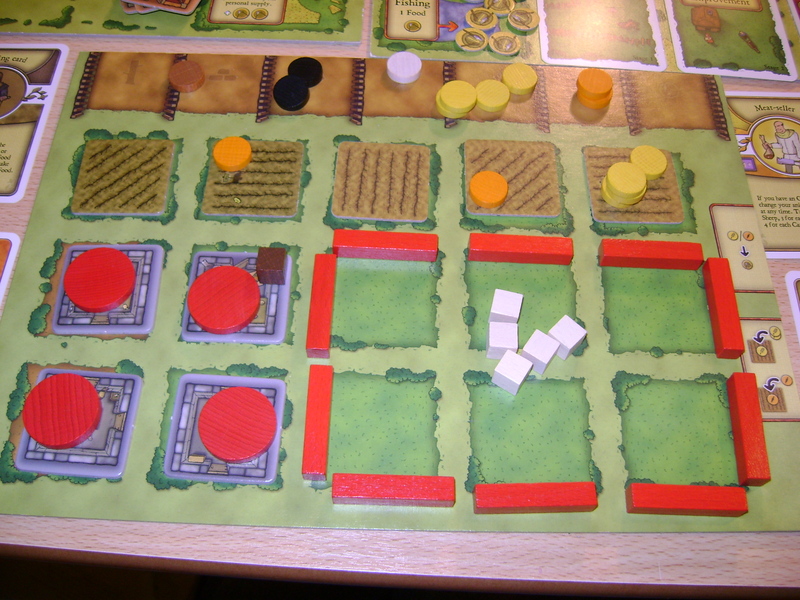 Rosenberg might have a range of party games and family card games to his name, but his big box ‘harvest’ games – particularly Agricola, Le Havre and Ora et Labora – share a great many common features. And then there’s Friedemann Friese. For the taxonomist, his work is incredibly diverse: whether classifying by weight, by mechanisms, or by game length, the spectrum of his work is broad. Nevertheless, there is a certain comprehensibility to his games as a body of work. Partly, this is cosmetic: his lengthy partnership with artist Maura Kalusky helps to make his games recognisable, while his fondness for the letter ‘F’ and the colour green also serves to tie the strands of his work together. Another, less superficial, feature of much of Friese’s work is the employment of wobbly, crooked systems the rigidity of which players cannot help but test in the course of playing his games. Network-building game Power Grid and its numerous expansions all offer maps with unequal concentrations of cities: there’s a game of chicken within the wider game, in which a player’s courage is tested – will he or she boldly try to hustle it out in more immediately desirable areas, or will he or she be more cautious and try to build up a network in an isolated area and hope this means little competition. The game is imbalanced if its players allow it to be – if a player beelines for an area with lots of cheap connections, he or she must be stopped by other players, because the game will not do that work for them (though the turn-order system does limit the value of an early lead). Fast Flowing Forest Fellers, a chaotic racing game, works somewhat similarly with respect to the skew-whiff courses it challenges players to race along: there are ostensibly better and worse routes to the finishing line, but taking the better route dares other players to obstruct you. Famiglia, on the face of it, is different. 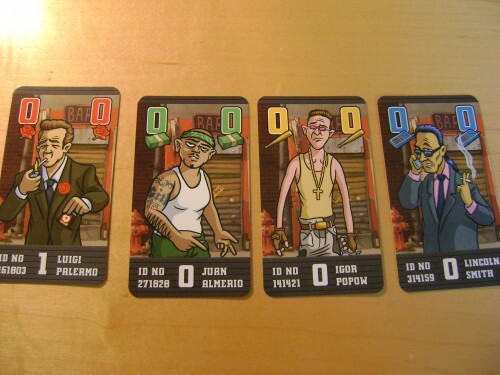 A two player card game from 2010 about recruiting mafiosi, it is in some respects more structurally symmetrical than those other games. Each player starts with a functionally identical hand of cards – one of the lowest value of each of the game’s four colours (though there is flavour in the fact that the characters on each card have a different name and portrait). Furthermore, each colour in the game is built as a pyramid: there are five cards at level 0, four at level 1, three at level 2, up to one at level 4. Nevertheless, the Friese feeling is here. Famiglia is a twist removed from many other small box card games. 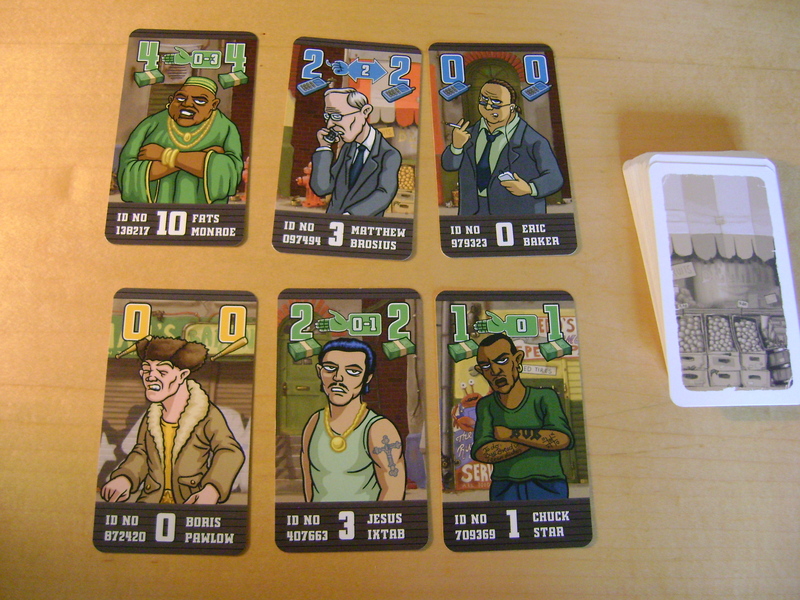 Card collection, the crux of the game, is built upon a slightly peculiar process: cards from a central pool, called the street, can be collected (contributing victory points) if a player reveals two cards of the desired colour from his or her hand, each one level below the card to be collected (the exception being level 0 cards, which can be taken without the presentation of any cards). For instance, to claim a level 2 red card, a player should reveal two level 1 red cards. 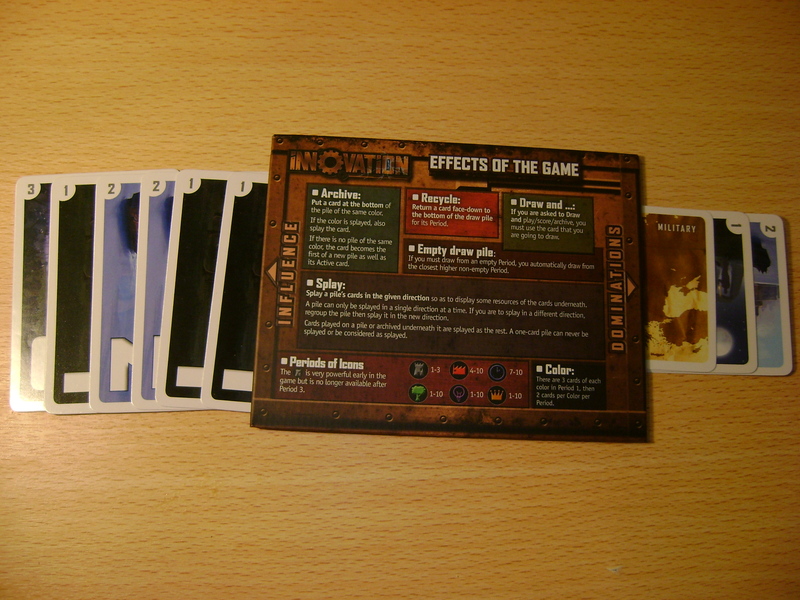 The collected card is added to the players hand, and one of the revealed cards is also returned to it. The other revealed card is placed on the table, in a personal play area. That card cannot then be used to collect new cards. This strangeness does affect the feeling of playing the game. In that fewer and fewer cards are available at each level of the pyramid, and in that one card is removed from a player’s hand each time another card is collected, progress is stuttering. The rhythm of the game is the juddering one of a more complex Friese machine, like that of Power Grid or Factory Manager. Indeed, the central engine of Famiglia is so clunky as to require an extrinsic injection of energy to keep functioning: given that a player must remove a card from his or her hand each time he or she claims one, help is necessary to climb the game’s pyramids. This comes through the special powers assigned to three of the game’s suits. The green cards, the Mercinaries, can act as wild cards, used to represent any colour, and can also be used as if they were of a lower level. So, a player could claim a level 2 blue card, say, using one blue card of level 1, and a green card of level 2 or above. A yellow card (a Brute), can reduce the value of a card in the street. 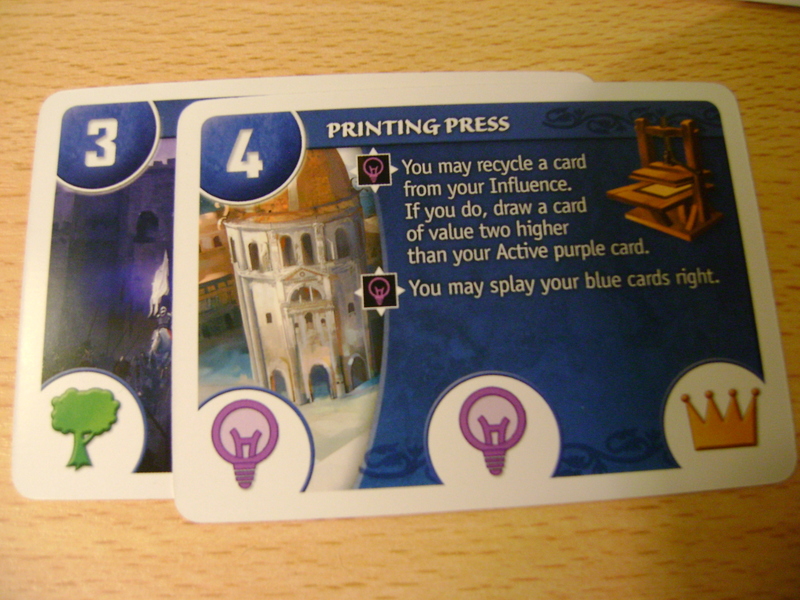 Blue cards (the Accountants), can be used to exchange hand cards with those in a player’s own play area. This is enough to keep card collection from sputtering out. 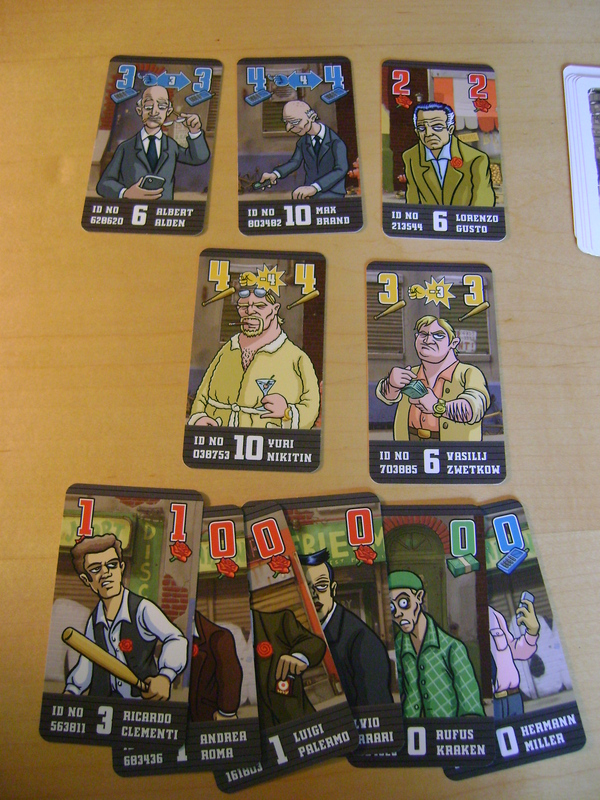 Most rounds of Famiglia go the distance (the game ends when almost all of the cards from the street have been collected), rather than terminating earlier through both players hitting dead ends. These special powers do also generate some reasonably satisfying conundrums. If a level 4 card, with a high number of victory points attached to it, appears, say, midway through the game, it might be possible to collect it – using, perhaps, a combination of yellow and green special powers to facilitate its collection. But the cost of doing so (in expelling important cards from a hand) can make future card collection more troublesome, potentially ceding momentum later on. Each suit, to a moderate degree, also has a stage of the game at which it is more useful – meaning there is room for a degree of strategic thinking. The green mercenaries are helpful to have early on, since just one of them at level 1 or above can make any level 0 odd-or-sod part of a pair. On the other hand, yellow brutes come into their own later, when collecting high value cards becomes more urgent. But, given how welded on so much of Famiglia feels, it’s hard to escape a sensation of imminent malfunction: the hand a player crafts never really feels like something to glory in, but rather a collection of uncohesive bits and pieces. I know that I should aim to collect the 15-point red level 4 card (the Brando-alike Alberto Negri), but I never quite want to do so because it leaves my hand much diminished in its effectiveness. This is, by the way, a much more pronounced feeling than I have in in playing Dominion (where victory cards tend to be functionless), because then I’m mildly compromising a deck of some size, rather than polluting a hand of perhaps four or five cards. This unweildiness is reproduced in the game’s demand for table space: as more and more cards are added to each player’s play area, each becomes more sprawling and awkward (the rules are not explicit on this point, but it feels that all play area cards ought to be visible to both players). 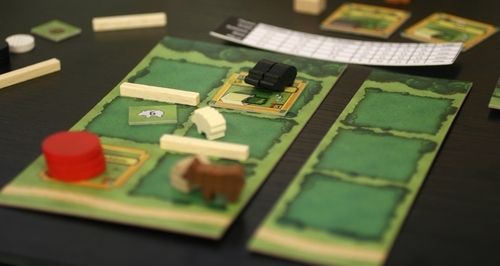 It’s portable, but doesn’t necessarily make a great travel game. There’s pleasure to exploring the idiosyncratic, and Famiglia, like other of Friese’s mixed-up oeuvre, provides that. But becoming acquainted with it is like taking on a job as a maintenance worker at the Large Hadron Collider, and finding that it’s all held together by ad hoc welding and improvised electronics: you’re not learning to manage the system, but the fixes to it. From one perspective, that might not be important: if a game works, perhaps it need not matter how. But where the player-provided balancing of many of Friese’s multi-player games generates negotiation and emotion, playing the suit-power sustained Famiglia means the players have no choice but to reproduce the sticky fixes of an absent party, with the disillusionment provoked by conspiring in inefficiency and iffiness. It’s nobody’s fantasy to sustain some half-botched repair job, and because of this, Famiglia is ultimately not fantastic. I want Painted Wooden Cubes to be about games, rather than about me, so I’ve largely resisted providing justification or explanation regarding the games which I review. However, the material I cover, taken together, might appear to tell its own unbidden story. I just want to intervene to make sure the story which is coalescing isn’t misleading. Most of the games I have written about are not fresh new releases. Because of this, there might be the assumption that my goal is to celebrate those games which have resonated with me, whether new or not. That isn’t precisely true. Though a number of the games I have written about are games I love, that in itself is not the reason I’ve felt it valuable to comment on them. What’s more important to me is that I’m well acquainted with a game before I write about it. And, in that a game collection is more or less unavoidably sculpted in large part by the whims of circumstance – particularly if it is amassed with a spirit of experimentation and exploration, rather than deliberation and trepidation – a number of flawed games can become familiar. I want, through the process of writing a review, to explore that acquaintance between me, as a player, and the game in question, flawed or not. I believe that when I know a game well, then the game can start to tell me things about myself which it wouldn’t have divulged immediately. Indeed, this can happen especially with a game I’ve played a number of times but do not entirely love. Amyitis is one example. It has a personality; stubborn, sour sometimes, and a bit terse. But then, how one engages with a difficult encounter has more to say about one’s depth of personality than how one handles a comfortable situation. Amyitis, with a name like a disease, is a sickening sort of number in large part because it overburdens its two neat central mechanisms with an excess of pfaff, though there’s also something infectious about it. It ostensibly concerns the planting of the Hanging Gardens of Babylon (the titular Amyitis was the wife of Neo-Babylonian king Nebuchadnezzar II, who supposedly built the hanging gardens for her) – a novel, fertile idea for a game – but mostly reduced here to the ubiquitous exchange of resources; players collect palm, barley, salt, dates and wine, and aim to trade them for plants for the gardens. 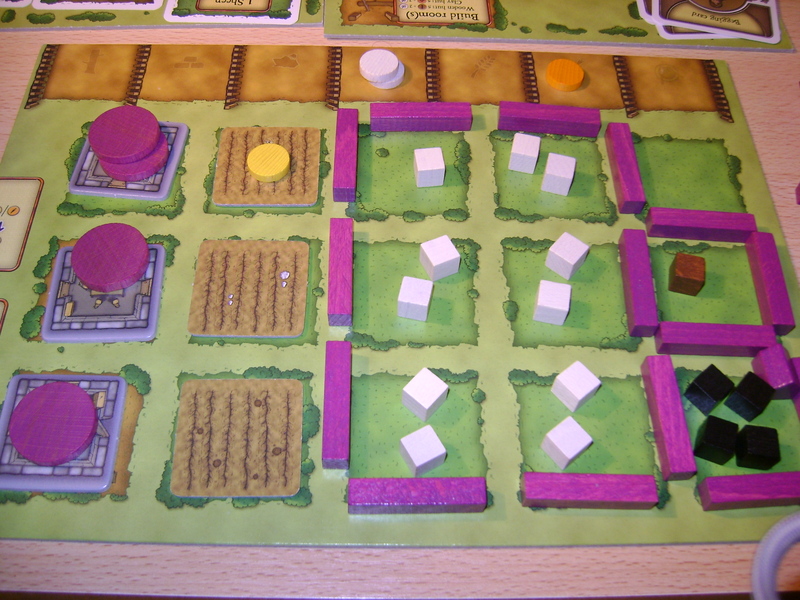 For each plant contributed to the gardens a player takes a tile which will provide victory points, and may provide another bonus in addition, such as money. Of the two main mechanisms which co-exist for selecting actions, one sees players selecting cards with special powers from a common pool. Four types of cards exist, though it is not certain all will be seen in all rounds (with two players six cards are offered, with three players nine cards, and with four, twelve). 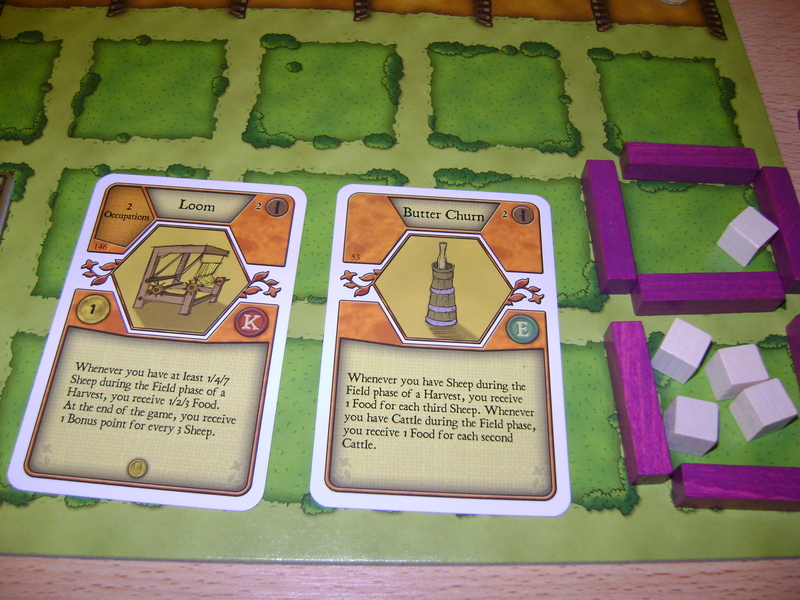 The peasant card, for instance, allows players to collect goods, while the engineer allows the player to irrigate a section of the gardens. The twist is that the cards are laid out in blocks of three (not sorted by type). The first card from a block is free to use, the second costs one coin, and the third costs two. Players select cards in turn, and can activate as many in a round as they wish (and can afford). In that money is limited, this makes not only the choice of action important, but also timing. If a block of cards comes out with just peasants, and, for whatever reason, it isn’t a good time for other players to utilize the peasant (if, say, they have more urgent goals), a player might be able to take another action first, and still have a free action waiting when play comes back. This in itself works well. The problem is with amount of added complication to each action. Thus, for instance, using the peasant card does not purely allow a player to take a good. There are two tracks from which goods are chosen, with five spaces each – one for each type of good. A player must take the leftmost available good from either track (marking that he or she took a good with a cube of his or her colour). Wine, it has to be remembered (and explained) is wild. When a track fills, the player with the most cubes in that track takes a gardener card, helping him or her to plant lower quality plants in the hanging garden. If there is a tie for first place, no bonus is awarded. All this adds a lot to remember, but little extra in the way of meaningful choice: if I need a good, there are after all of this palaver only two options available (maybe one, if both tracks have the same good on offer). There’s a pretty good chance one will be wine, which it’s pretty much a no-brainer to take (and, on the flipside, if one of the goods on offer isn’t wine, then one of the goods may well occupy the space before wine, meaning you set up your neighbour to claim the wine if you don’t avoid it). The gardener card doesn’t change much in this respect: it’s worth too little to make it a major factor in most decisions. Instead of selecting an action card, players may activate a space on a rondel. Here goods can be exchanged either for plants (which must immediately be planted in an irrigated section of the gardens – if one isn’t available, then neither is the plant), for cards granting special powers, or directly for victory points. 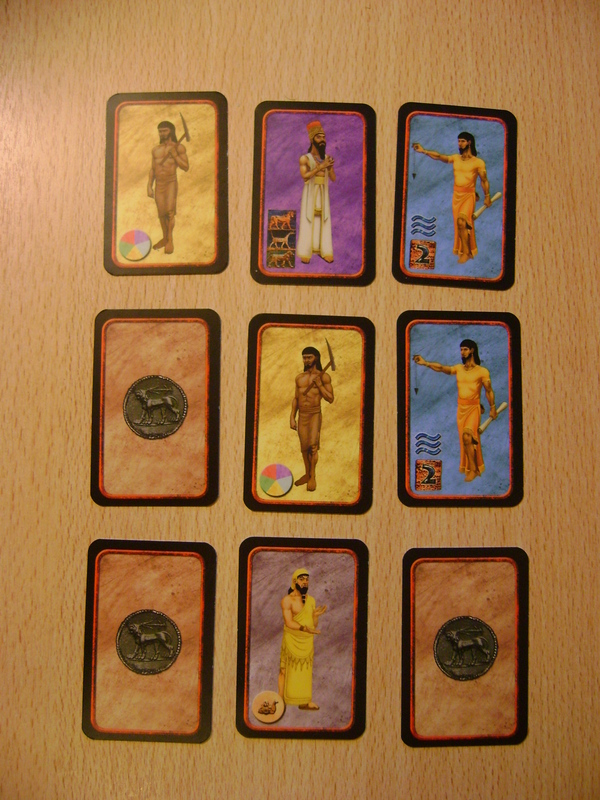 A caravan commonly controlled by all players is moved to a subsequent space by paying a camel token – typically acquired through the merchant action card. Each space requires at least one particular good, and perhaps two, to be activated, so the rondel is employed much less often than the action cards. As the game advances, players can collect caravan cards, which allow them to skip a greater number of cities when moving the caravan. For much of the game, however, there’s not much to be decided on here either; if it’s possible to move the caravan, through having the required good for the next space, it’s usually best to do so. There is an issue of timing again – while card actions get more expensive as a round progresses, moving the caravan doesn’t. This, though, doesn’t really provoke significant tension; in that one cannot move the caravan without employing the action of the space to which it’s moving, a player must always telegraph a possible movement. The designer of Amyitis is Cyril Demaegd, whose earlier jewel-collecting number, Ys, I like rather less begrudingly. There’s not necessarily all that much to tie the two games together, however, beyond the very recognizable Ystari artwork featured in each (the artist in question is Arnaud Demaegd, the brother of Cyril). Where Ys is somewhat intricate in its scoring (players simultaneously bid to collect gems, and bid to revalue them), the fundamental gameplay of Ys is very simple: players take turns making one public, and one private bid. Amyitis is arguably simpler in its scoring (though there are a few means to pick up victory points, the primary method is through contributing to the garden), but much more complicated in the playing. So what is infectious in Amyitis? Its core, for all that obfuscates the fact, is solid. Timing when to select a given action card provokes satisfying rumination, even if the action card itself gives more hassle than genuine choice in its activation. And, while the rondel feels a little peripheral (it’s even on its own small board), it does provide a means by which the immediate utility of a given good can fluctuate which functions well even with just two players. I so wish a lot of the cruft had been removed from Amyitis before its release; a leaner, fitter, healthier game could have been built upon the same skeleton. But, had Amyitis been such a thing, been a more taut, more efficient composition, it would have communicated something different. When one has to unpack a message, the process of unpacking becomes part of the message in itself. We have, in life, to be ready to deal with meandering and confused communicators as well as smooth speakers. In the way it stubbornly guards the simplicity of its core, Amyitis represents an awkward interlocutor, but one I try to interact with patiently, because it has enough to say to make hearing it out worthwhile. It’s worth noting that this review is of the 2011 Iello version. As well as introducing some great artwork, the Iello edition changes a large amount of terminology from the Asmadi edition. Here, I use exclusively the Iello terminology. At half an hour in, we’re roughly midway through a two-player game of Innovation, a tableaux-building civilization game by Carl Chudyk, and I’m well behind my opponent. I have less influence, have achieved fewer dominations, and have fewer resources. It comes to my turn. I could try drawing a card and putting it into play; it might be something I could use in the next turn. But there’s a fair chance the card will be useless to me, given that I lack resources to fuel card effects. Also, next turn is an age away when my opponent has a potent and versatile tableau in front of her. Her civilization is developing fast. So I look at the cards I have in play, and their effects. There has to be something there to exploit. In Innovation, there are two types actions offered by cards, referred to as dogmas. The first type, supremacy dogmas, affect any opponent with less of a particular resource than the player issuing the dogma. However, trees are the only resource of which I have more than my opponent, and none of my active cards utilizes trees. The second type of dogma is the cooperative dogma. All players can take advantage of these if they have at least as many of the required resource as the active player. If a player in addition to the active player uses one of these dogmas, then the active player is able to draw an extra card by way of a bonus. 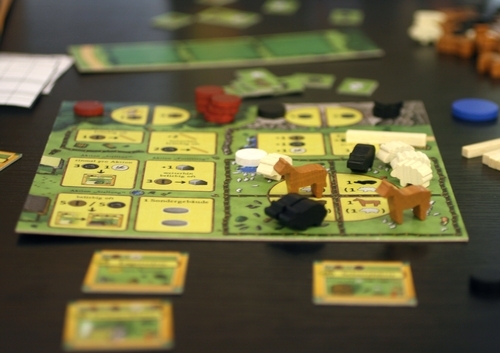 Naturally, in a two-player game, it is often best to use cooperative dogmas when holding the majority of a resource, because then you alone can employ the action. I have Experimentation among my cards. It has a cooperative dogma, which insists that the affected players draw and put into play a card from the fifth era (cards become progressively stronger in each era, reflecting human progress). There is, though, only one card left in the fifth pile. My opponent, who must carry out the dogma first, will take this, meaning that when I use the dogma, I draw and put into play a card from the sixth era instead. It’s something of a risk, of course: since my opponent has more resources, she will most probably be able to utilize any dogma provided by the card she receives. It’s the kind of speculative experiment that befits a card named ‘Experimentation’ (Other cards also suit their titles in neat, sometimes subtle ways: for instance, Gunpowder effectively knocks down cards with the castle resource, while Globalization later does the same to trees). My opponent draws, and receives Coal. It’s by no means a bad card, but it replaces Pirate Code among her active cards. And she’s been attacking me with Pirate Code relentlessly since she drew it. I’m glad to see it replaced. I get Vaccination. It has a supremacy dogma requiring trees. It’s a great result – I can start to attack back, at last. And, because my opponent had to use this dogma, I get another draw. I pull Emancipation. It won’t be immediately useful (I don’t have the resources to exploit it at the moment), but nonetheless I’ll smile and try to kid my opponent that it was exactly the card for which I’d been hoping. I guess the point is Innovation clicks with me, and with its own title, because it allows for innovation. Opportunities for gaining extra value from a card arise and recede quickly (a recycling action can return cards to the general supply), and spotting these chances is key in playing Innovation well. While the effect of something like Experimentation might initially appear invariable, it isn’t. Because the supply of cards from any given era can be depleted, its strength can sometimes grow. Similarly, it’s not infrequent that its first era analogue, Sailing (‘Draw and put into play a 1’) can be used, sometimes, to pull cards from the third or fourth eras. Moreover, in that a player has two actions per turn, combinations can sometimes be exploited. Imagine using one action to recycle a first era card, thereby restarting its supply pile, then using Sailing to force an opponent to take, and activate, the particular outdated card in question (thereby replacing a better card from a later era). However, while this kind of potential for exploiting flashes of inspiration during brief windows of opportunity may be a hallmark of a fine card game – which this is, it is a somewhat strange partner to the game’s epoch-spanning civilization-building theme. In that your tableau is unstable, you can lose the benefit of a technology as quickly as you gain it. It’s thematically strange that when you cover Sailing with another green card, you lose that power. It’s not how civilizations advance and weakens immersion in the game. Moreover, the volatility of each tableau means that calculating the level of resources you and your opponents possess is a chore which must be repeated many, many times in a single game. 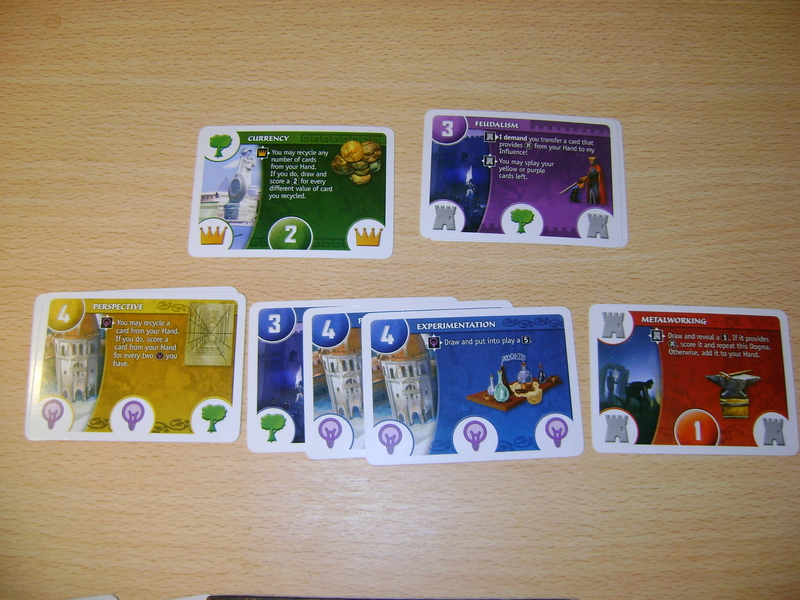 And though certain resources are only available on cards of certain periods – for instance, castles only appear on cards from the first three eras – this does not mean they become entirely irrelevant later in the game. One reason is that a player may dominate the military domain when he or she has three of each resource visible in his or her zone – meaning castles may stay a concern long after their real power fades. It’s the kind of game where better players must be not only quick-thinking, but also more attentive accountants. Because of these bureaucratic elements, Innovation is best played with two, or perhaps three players. With every player added, book-keeping escalates and control diminishes. Nevertheless, Innovation is in general a tremendously likeable, multi-dimensional and nuanced game. In particular, the potential for cards to surpass the overt limits of their power allows for splendidly nifty moments, and gives a pleasing reward for quick-wittedness. Though the moment-by-moment gameplay of Innovation fits uncomfortably with the game’s theme in certain respects, control does ebb and flow between players in a way that reproduces in miniature the swoops of history. In moments of inspiration, it is possible to claw back from bleak situations, as above. What is more (as W. Eric Martin’s review after nearly two hundred plays argues) this potential for innovative play stays, even after a great number of plays.